Caffrey's Macaroon Bar - traditional Irish chocolate bar consisting of a slab of plain chocolat..
Caffrey's Mint Crisp Bar - traditional Irish chocolate bar consisting of a slab of plain chocol..
Classic Liquorice Allsorts mixture that is great for candy buffets and parties. Each bag contains..
Liquorice Torpedoes containing a liquorice centre covered in a hard candy shell. 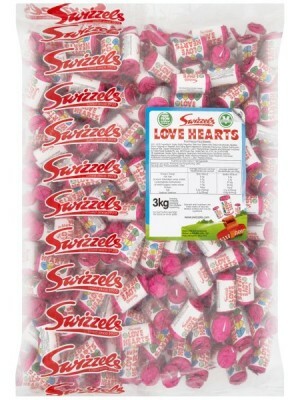 Each bag contain..
Soft and chewy Marshmallow Flowers in a bulk bag filled with assorted fruit flavoured mallows ..
Soft and chewy Marshmallow Pastel Mix in a bulk bag filled with twists and cylinders of p..